Shanxi Province located on the middle reaches of the Yellow River is often heralded as the cradle of Chinese history and culture. It is one of the oldest territories of China with a rich history leading back to the Spring & Autumn Period (722 – 403 BC) well before Qin Dynasty – the first dynasty of Imperial China. Retrace the footsteps of emperors, merchants and artisans via this bespoke private tour with professional English speaking guides. Visit grottoes of grandiose scales, impossibly built monastery, ancient walled town, magnificent mandarin courtyards, underground city and many places in between. Prelude to your Shanxi exploration is a 2 day stimulating tour that covers the very essence of Old Beijing: Forbidden City, Temple of Heaven, Great Wall of China and Hutong. Upon arrival at Beijing International Airport, you will be picked up by our friendly guide to Tiananmen Square (天安门广场) where you can visit Tiananmen Tower, Monument to the People’s Heroes, Great Hall of the People, Chairman Mao Zedong Memorial Hall and see the national flag lowering ceremony. Thereafter you will proceed to the Forbidden City (紫禁城) – the largest ancient palatial structure in the world and an epitome of China imperial past. The guided tour will bring you through the central axis of the Forbidden City from the Meridian Gate (Wu Men, 午门) in the south to the Divine Military Genius Gate (Shen Wu Men, 神武门) in the north. The main attractions include Gate of Supreme Harmony (Tai He Men, 太和門), Hall of Supreme Harmony (Tai He Dian, 太和殿), Hall of Middle Harmony (Zhong He Dian, 中和殿), Hall of Preserving Harmony (Bao He Dian; 保和殿), Kunninggong (Palace of Earthly Tranquility, 坤宁宫), Imperial Garden (Yuhuayuan), etc. 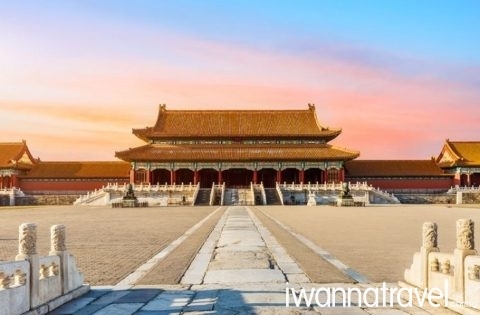 Conclude your tour of the imperial city with a hike up the hill in nearby Jingshan Park (景山) for a panoramic view over Beijing city and the Forbidden City. The park used to be an imperial garden for the monarchs of the Yuan, Ming and Qing dynasties. In the morning, you will visit the Temple of Heaven (天坛), a sacrificial temple used by both Ming and Qing emperors to appease the heavens, bring prosperity to the empire and ensure good crops for the coming year. In its overall layout and that of its individual buildings, it symbolizes the relationship between earth and heaven – the human world and God’s world – which stands at the heart of Chinese cosmogony, and also the special role played by the emperors within that relationship. 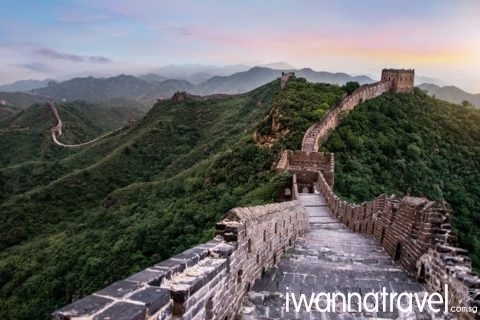 Thereafter you will proceed to Mutianyu Great Wall (慕田峪), one of the best preserved and most authentic sections of the UNESCO-listed wall. Being further away from Beijing (approx. 80km, 1.5 hrs. drive), it is less crowded compared to the over-hyped Badaling. The granite wall which was first built during the Northern Qi Dynasty (550-557 AD) and further enhanced during the Ming Dynasty (1368-1644 AD) measures 7 to 8 meters high and 4 to 5 meters wide. It is a 45 minutes uphill climb via 4000 steps from the visitor center to the top of the wall. You can also choose a leisure way up via cable car or life chair. At the top, you will be rewarded with endless views of lush rolling hills that extends north to the Mongolian steppe. Feel a sense of history as you stroll pass the watchtowers and peep through the crenellated parapets that were once launching pads for arrows against invading nomadic tribes. A fun and adrenaline way to bid goodbye to the Great Wall is to slide down from it via Toboggan. 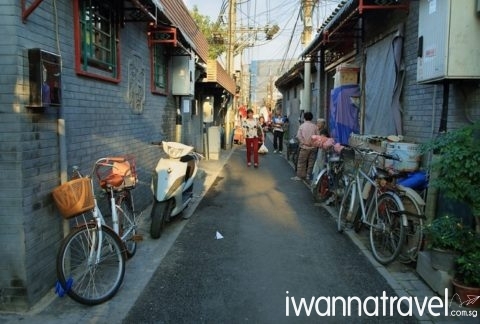 Enjoy a morning ride on rickshaw through Hutongs (胡同), old residential neighborhoods formed by narrow alleys and single story traditional courtyard houses. These unique housing structures which used to be ubiquitous are fast disappearing in the face of modernity. As you witness the social, economic and cultural history as told by the bricks, stones and tiles of these hidden communities, our guide will share with you some interesting stories behind these houses. You will also have a chance to visit one of the families living in the Hutong. After lunch, you will be transferred to the train station for your train ride (comfortable sleeper berth) to Datong (departs at 15:11; arrives at 22:11). Upon arrival at Datong train station, you will be transferred to your hotel. 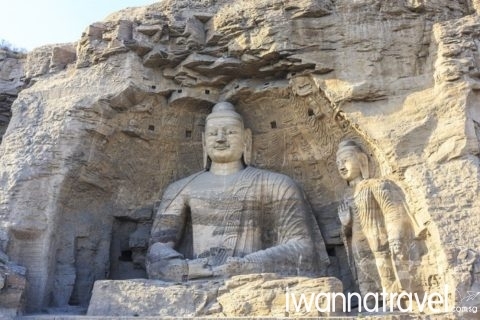 In the morning, you will visit Yungang Grottoes (云冈石窟), a set of ancient Buddhist caves carved into the sandstone cliffs of the Wuzhou Mountain during the 5th century CE by the Toba people of the Northern Wei Dynasty who adopted Buddhism as its state religion. The 1km long massive complex which composed of 252 caves and 51,000 Buddhist statues represents the epitome of Chinese Buddhist cave art. Caves 5 and 6 are the some of the most stunning art pieces; Cave 5 contains a 17 meter tall seated Buddha with a gilded face while Cave 6 with a brightly painted vaulted ceiling contains a 16m tall stupa intricately carved with images of Buddha’s life story. 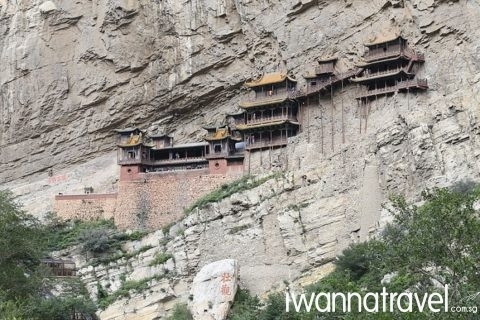 After lunch, you will proceed to the gravity defying Hanging Temple (悬空寺) which has been “hanging” from the cliff face of Jinxia Gorge for more than 1,500 years. The whole temple is kept in place with oak stilts slotted into holes chiseled out of the cliffs with the main supportive structure hidden inside the bedrock. The monastery is also the only one in China that enshrines Buddhism, Taoism and Confucianism within one compound. Thereafter you will be transferred to the train station for your train ride (comfortable sleeper berth) to Datong (departs at 14:19; arrives at 20:01). Upon arrival at Taiyuan train station, you will be transferred to your hotel. Step back in time with a visit to the UNESCO World Heritage Site of Pingyao (平遥) – the best preserved ancient walled city in China (approx. 1.5 hrs. drive). 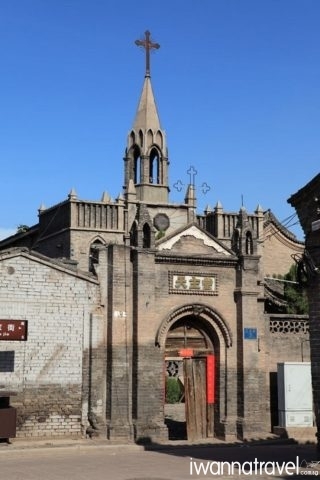 The city was founded in the 5th century AD; its city wall, cobbled streets and old buildings are mostly original and dated back to the Ming and Qing Dynasties. Understand how deposit schemes, loans and remittance services worked in Qing Dynasty by visiting Rishengchang Exchange Shop (日升昌票号), the very first established private bank in China. Roam around the Yamen which served as the administrative office and residence of the local magistrate. The Yamen also houses a court where trials were held and a prison with ancient torture tools in display. Explore the Temple of the City God (also known as Chenghuang Miao), a temple dedicated to the City God who was believed to provide divine protection to the city and its inhabitants. 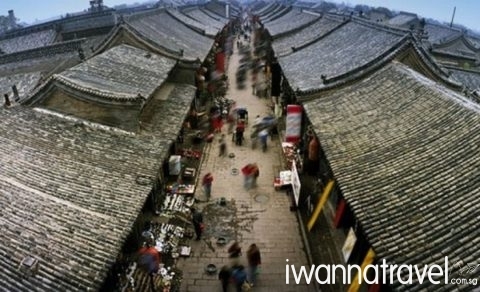 Take a stroll down Mingqing Street which used to be the main axis and bustling area of the ancient town. You can shop for some inexpensive souvenirs, watch the ancient architecture and local life, or learn some ancient techniques of making handicrafts. Climb up the city wall and its watchtowers for a panoramic views of the city below. Depending on your interest, you can also drop by Jinci Temple (晉祠) on the way to Pinyao. The temple which was founded about 1,400 years ago and expanded through Sui, Tang, Song, Yuan, Ming and Qing Dynasties is considered one of the most original and oldest temples in China. It is well known for its three treasures: Figures of the Maidservants, Zhou Cypress (believed to be 3,000 years old) and Never Aging Spring. 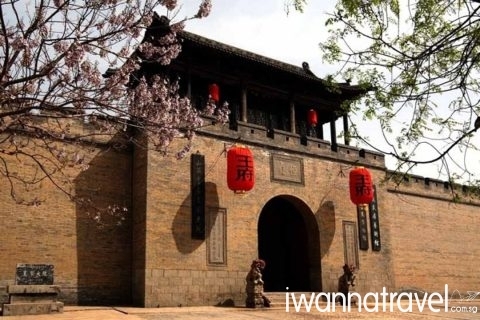 In the morning, you will visit Wang Family Courtyard (王家大院), a colossal residential complex built by the Wang family of Jingsheng, one of the four most prominent families of the Qing Dynasty. This luxurious residence consists of 123 courtyards and0 1,118 rooms and took half a century (17621-1811) to build. The complexity of the compound is matched by its distinctive architectural style and artistic finishing; decorative lattice screens, windows and archways, graceful eaves and tiled roofs, intricate timber and masonry cravings, complex mortise and tenon joints. Paintings, calligraphy, and antique furniture also decorate the houses. Its building and decoration reflect the strict hierarchy back then, and the carvings and statues all imply lots of meanings and stories. After lunch you will proceed to Zhangbi Underground Castle (张壁古堡), a 1400 years old labyrinth of defense tunnels built by the Sui Dynasty against the invading Tang army. Its underground tunnel which was scientifically constructed according to ancient Chinese astrology consists of three layers that are up to 10km long (about 1.5 km is restored and opened to visitors). Descends as deep as 80 feet underground to view storage rooms, guardhouses, bedrooms, ambush traps, escape routes, and air vents. In the morning, you will take the bullet train (departs at 08:41; arrives at 12:52) back to Beijing follow by airport transfer for your flight home. Need more information on this tour? Read through our Shanxi frequently asked questions (FAQ) and get them answered!